Use playground equipment to demonstrate forces and energy transfer. Ask students to use their bodies and the equipment to move in different ways: spin, roll, slide, lift, fall, bounce, swing. They can also be given balls to use. They can use a worksheet to check off each motion, and draw the equipment they used. They can optionally also add an arrow to draw where the force comes from to push on their bodies and make the motion e.g. 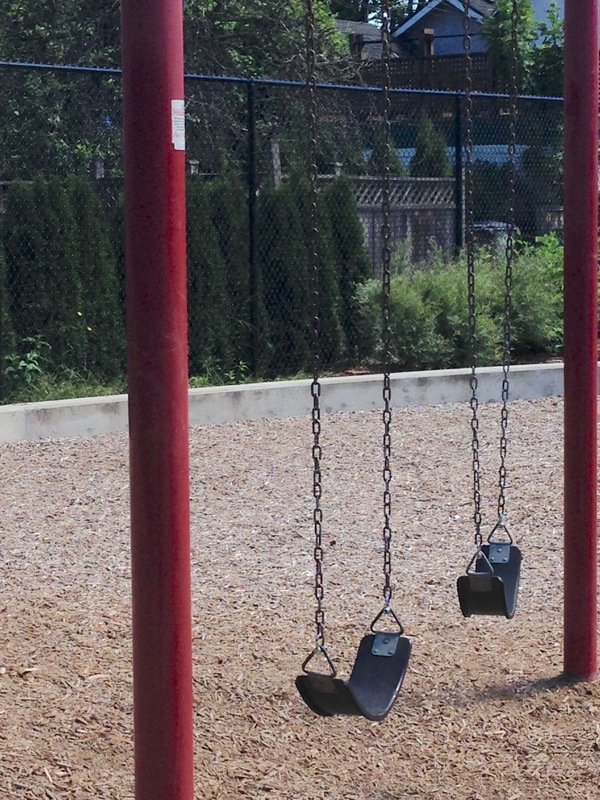 the seat of a swing pushes on their body to make their body swing upwards. 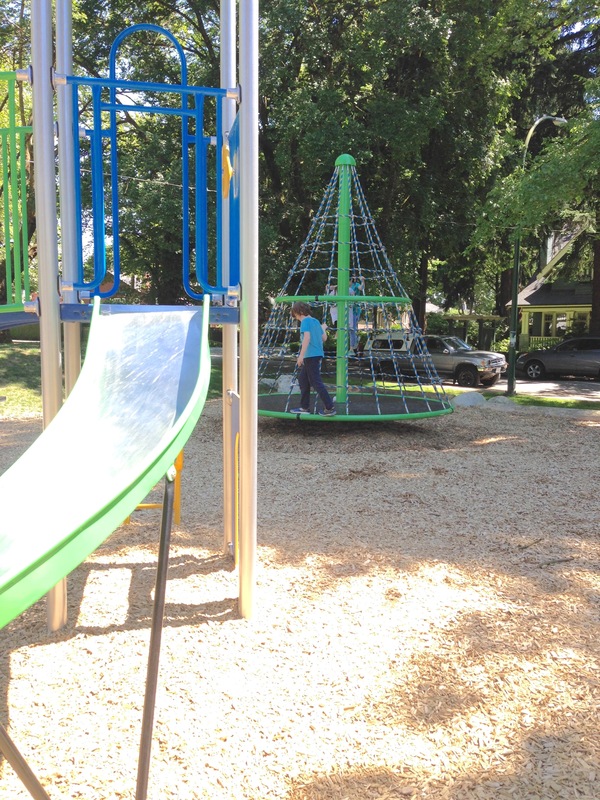 Try the playground equipment, and discuss the different kinds of energy used. A swing has motion energy as it moves, which changes to potential energy (or "height energy") as it gets higher. Each time the swing goes back and forth, it has the most motion energy at the bottom of the swing, and the least when it comes to a stop at the top of its swing. It has the most potential energy when it is highest and the least when it is lowest. Energy changes between motion and potential energy forms and back again, as it swings back and forth. This demonstrates that energy can be transferred, but is always conserved. A spinner has rotational energy. Ask students to compare how fast they move when they sit on the outside or the middle of the spinner. They move much faster on the outside as they travel further in the same time as someone sitting in the middle of the spinner (look at one rotation to compare). You can feel the force pushing you outwards as you hang on to the spinner. If you let go of the spinner, you would fly off, but in a straight line from your direction of travel, rather than straight outwards (as dictated by Newton's First Law: objects will keep moving in a straight line unless acted on by another force). A slide converts potential energy to motion energy. As you climb the steps you gain potential energy (from gravity pulling on you). As you slide downwards, the potential energy reduces, and is converted to motion energy. A slide is an inclined plane, so the gravity pulling you down presses you onto the slide. As you move, there is friction between you and the slide. Friction is a force that slows things down as objects rub together. The rubbing generates heat energy, which is quickly lost to the air. Students with bare legs may feel that heat energy made from the friction between their body and the slide. Energy is transferred but always conserved. 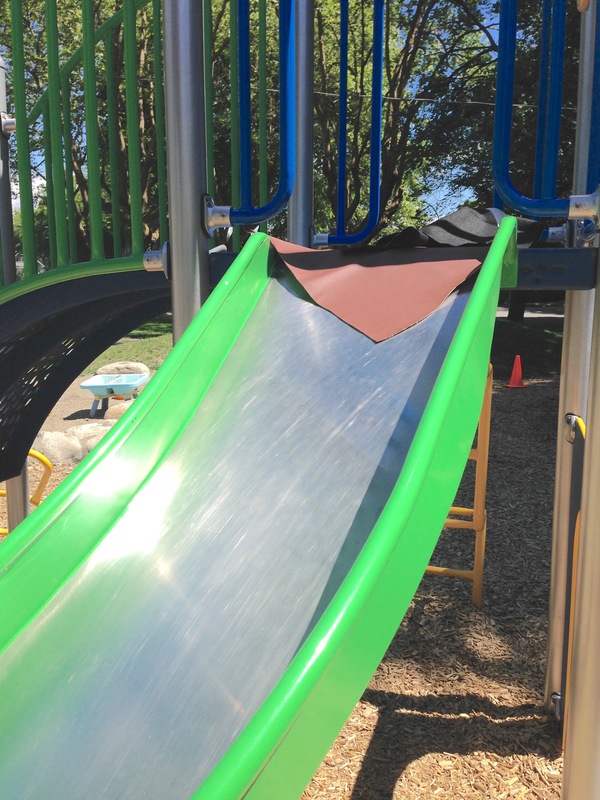 As some of the potential energy you had at the top of the slide is lost to friction as you slide down, you descend more slowly than if you simply jump from the top of the slide. Slides are made of smooth material to reduce friction. Students can experiment sliding on different pieces of cloth, or onto of jackets etc, to experiment with which materials reduce the friction most, and allow them to go the fastest down the slide. Use this activity to study gravity: students are challenged to use the playground equipment and list/draw all the times they use gravity. e.g. gravity pulls students down the slide or down to the ground when they jump off something; gravity brings a swing back down after a student has used the forces of their bodies to push it up.